this case. First thanks to Richard and second what would your answer be? This is without doubt an iris cyst. There isn’t a differential list here; iris cyst is the only possibility and iris melanomas or naevi just don’t look like this pigmented sphere in the anterior chamber. Quite what to do with them is another matter. One cyst is unlikely to cause much of a problem, but where many occur, as in this second case, and especially in Golden Retrievers, glaucoma can supervene. 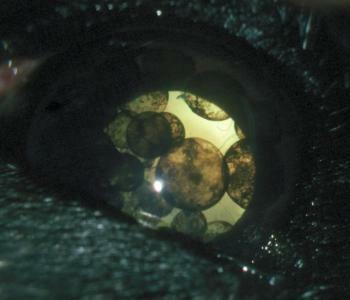 One can remove them by aspiration under general anaesthetic or by laser surgery, as reported by Anne Gemensky-Metzler in her paper ‘The use of semiconductor diode laser for deflation and coagulation of anterior uveal cysts in dogs, cats and horses: a report of 20 cases.’ from Veterinary Ophthalmology 2004 7:360-8. 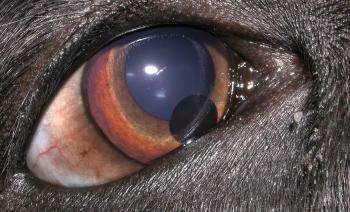 This entry was posted in Cases and tagged dog, Iridal cyst. Bookmark the permalink.